We have learnt that Toastmasters rewards success and leads to success. We have seen how District 72 (New Zealand) is one of the most successful Toastmasters Districts in the world. We have heard specific examples of how our Toastmasters programme has lead to success in the personal, community and business lives of our members. Now we will look at how you can go about designing your personal plan for success. First let us look at some of the outstanding resources for success that Toastmasters offers to its members. We have our Communication and Leadership manual, we have 15 Advanced manuals covering everything from informative speeches, to storytelling, to communicating on TV, and we have our competent and advanced leadership programmes. To illustrate how we can go about designing your personal plan for success let me use two examples of members from Clubs I belong to in Rotorua. Michael is in his early twenties and had been in Arawa Toastmasters Club for about three months when I helped him design his personal plan for success. I asked him to close his eyes and visualise giving a very successful presentation to an audience where everything went well. I then asked him to tell me what the audience looked like (very professional), how they were dressed (in business suits), what they were doing (nodding in agreement with him). Then I asked him what he looked like (confident, very smartly dressed in a dark suit with a red tie, persuasive). I then presented Michael with the plan shown below. The Communication and Leadership Manual would give him the basic building blocks (and a CTM). The Professional Salesperson and the Professional Speaker Advanced Manuals would give him the skills he needed to be a confident, persuasive speaker (and an ATM-B) in front of the audiences he saw himself. The Competent Leader programme would give him additional skills and recognition that would help him get what he wanted out of Toastmasters. Michael was rapt with his plan. He could see where his investment in time with Toastmasters was leading him. Margaret is a self-employed journalist and had been in the Lake City Breakfast Toastmasters Club for about 12 months before I helped her design her personal plan for success. After going through the same visualisation process with Margaret it was obvious that her plan would be substantially different from Michael’s plan. Margaret’s audience was different (there was more entertainment involved) and she wanted lesser involvement with the leadership side of Toastmasters and a greater commitment to developing her presentation skills. 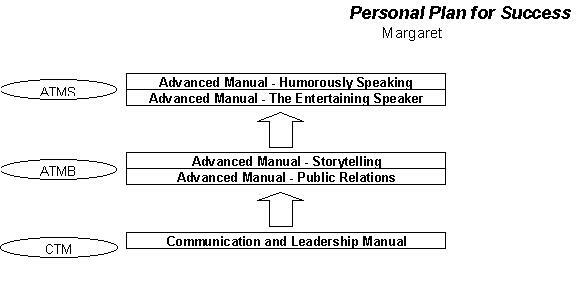 Like Michael, Margaret now has a plan for her success as a speaker that extends several years into the future. Designing a personal plan for your members has a number of benefits. It has benefits for our members: it makes our members aware of what is available; it asks them to think about what they want from Toastmasters in specific terms; it develops a personal, not generic, plan for them which is more likely to meet their needs. It has benefits for our Clubs: our customers (= members) will be more satisfied; they will be more likely to stay longer; it will allow easier meeting programming and planning. It also has benefits for our District: we will have stronger, healthier Clubs; it provides opportunities to identify future leaders; membership retention will be improved; it will be easier to meet membership growth goals. Membership retention is a challenge that all Clubs face. A fifth of our members leave within six months and a third within one year. This is the time that members start to feel more confident (which is not the same as competent) in their speaking ability. Without a personal plan for success I believe that many who leave Toastmasters early are not really aware of what our organisation has to offer them. Maybe if we helped our members design their own personal plan for success we would be able to extend the average length of membership from 1.9 years to 2.5, 3 or maybe even much more. Designing a personal plan for success for each of the members in your Club is not an arduous task (particularly if it is made the responsibility of the mentor who is assigned to that new member in the early stages of their membership). I believe that many benefits will flow to your members, to your Club and to our District by doing so. Why not plan a meeting theme around "Designing Your Personal Plan for Success". This article is an excerpt from a seminar Toastmasters -Your Gateway to Success that Glen presented at the District 72 Convention in Napier in May 1999.